The weekend is over, and you're itching to get things done, but Mondays are a good time to learn something new. With that, we'd like to welcome you to a brand new series on the MFT Challenge & Inspiration blog — Class Is in Session! When class is in session, we'll be sharing tutorials and tips to take your craft to the next level. Learning something new can be fun, and it gives you the opportunity to explore fresh concepts and techniques you've been dying to try. This week we're going to take a look at Wonderful Watercolors! Adding water to pigment by way of watercoloring creates a very pretty look. The more water you add, the less vibrant the color becomes and vice versa. Incorporating watercolors is definitely a hot trend, and if you're like me, you might be a bit skittish about where to begin. Watching a YouTube video is a great way to learn. You can pause and rewind to your heart's content until you get the information that you need. Today's video will give you a step by step of how to create pretty watercolor backgrounds. Watch the video below or click HERE to watch on YouTube. Wasn't that fun? All of a sudden, it doesn't seem as hard as I thought! Make sure to follow the My Favorite Things YouTube channel for more tutorials! Let's take a look at a few examples of other projects with watercoloring. 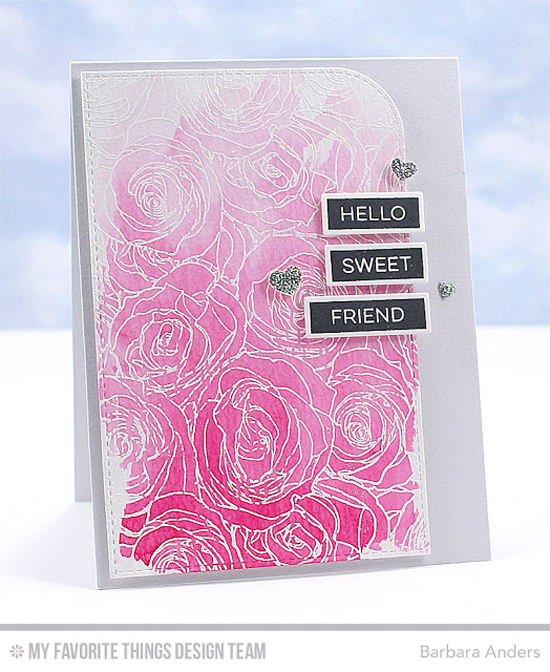 Barbara stamps and embosses a background, and the watercolors resist the embossed image. Kay expertly combines more than one color to create a gorgeous and artsy background. The crisp elements of the rest of her design *shine* against the watercoloring. 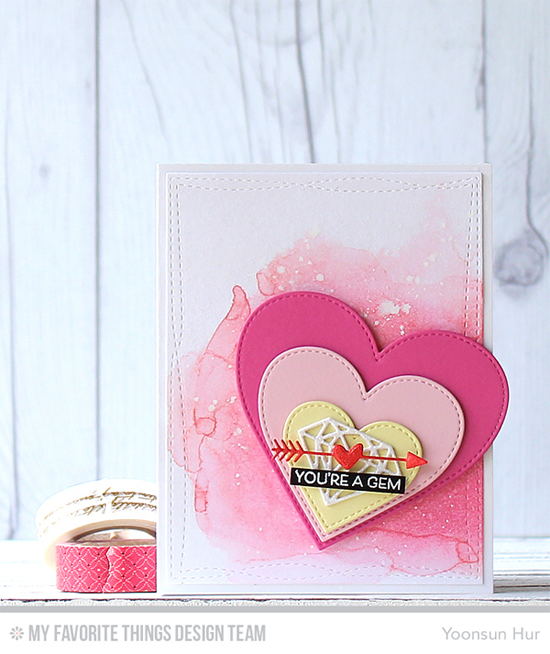 Yoonsun uses the smooshing technique with her watercolors and adds dots of white with a mini-mister for a soft and pretty card. Great new challenge, thanks for the informative video! The card samples are all watercolorlicious!! Beautiful cards. Love this technique. Thanks for the video.